Tibor de Nagy Gallery is pleased to present Fossar/Waterfalls an exhibition of recent works by Hildur Ásgeirsdóttir Jónsson. This will be Jónsson's second solo exhibition at the gallery and her first at the gallery's 15 Rivington Street location. The artist lives and works in Reykjavik, Iceland and Cleveland, Ohio. 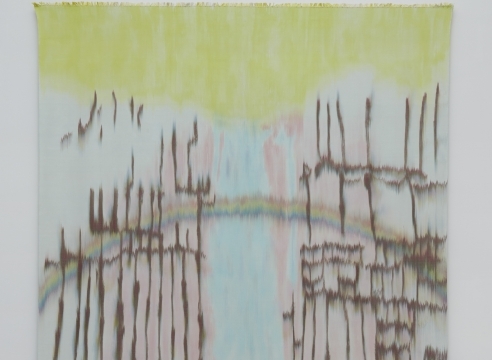 Jónsson is a painter and textile artist who uses silk and dye in a hybrid process to create large-scale fabric installations based on the landscape of her native Iceland. She begins each weaving by painting directly on the loose warp (vertical) threads laid out on a flat surface before they are wound onto the loom. Once the painted threads are on the loom, she weaves the weft (horizontal) threads in a process whereby the fabric and image take form simultaneously. As the warp and weft threads integrate, the original painted image begins to morph - blurring the edges and creating an atmospheric quality in the final work. This exhibition includes three large-scale works, one measuring over 15 feet tall. In these works Jónsson focusses on two Icelandic waterfalls, Dynjandi and Svartifoss. Dynjandi is a large, wide waterfall with an almost circular shape that many say resembles a lace veil. Svartifoss is a tall, narrow waterfall dramatically surrounded by black basalt stones. In Jónsson’s treatment of these waterfalls, she has extracted their primal shapes and used them as focal points and structures in which to explore color and gesture in her unique working process. All of Jónsson’s work has its origin in the landscape of her native Iceland which she travels to twice a year to photograph and make preliminary studies. As a volcanic island, Iceland has one of the most unique natural environments in the world. Among its many natural wonders are the largest glacier south of the artic, gushing geysers, natural hot springs and numerous rivers and waterfalls. As the artist studies these locations, she focuses not so much on the vista as a landscape painter would, but rather on forms and shapes underlying the natural formations. Back in her studio in Ohio, she enlarges and projects the images, reworking them until she has the desired composition. Jónsson’s practice often draws parallels to the “color-field” painters Helen Frankenthaler and Morris Louis – and the Greenbergian ethos of unifying paint and surface. Her work has an affinity to Milton Avery's approach, where a few isolated shapes are rigorously pursued through style and color. She is also in the orbit of more contemporary artists who have worked in textiles such as Alan Shields and Polly Apfelbaum, like them Jónsson is inventive and experimental and creates an amalgam art form based on color, texture, biography and process. Hildur Ásgeirsdóttir Jónsson was born in Reykjavik, Iceland in 1963. She has a BFA and a MFA from Kent State University. Recent notable exhibitions include Carl Solway Gallery, Cincinnati, the Tang Museum, Skidmore College, Reykjavik Art Museum, MOCA, Cleveland, Pocket Utopia, New York, Turpentine Gallery, Reykjavik, she was included in the group exhibition Pretty Raw: After and Around Helen Frankenthaler, at the Rose Art Museum, Brandeis, curated by Katy Siegel. The artist has received numerous grants and commissions, including The Louis Comfort Tiffany Foundation award, The Cleveland Arts Prize, Ohio Arts Council Grants, and public commissions from the Hilton Hotel Convention Center and the Cleveland Clinic Foundation.